While there have been several instances of confrontation between the Union Government and a State over jurisdictional issues over the last seven decades, what happened in Kolkata recently was clearly unprecedented. The hostility displayed by the West Bengal Police towards officers of the Central Bureau of Investigation (CBI) and the political street theatre that followed could have serious ramifications for the survival of the Constitutional scheme of things if this were to be emulated by other States. Although the CBI is investigating the chit fund scams in West Bengal and some other States on the directions of the Supreme Court, its officers were treated like an alien force by the Kolkata police. The central agency told the apex court that its officers went to the residence of Rajeev Kumar, the Kolkata Police Commissioner, on February 3 because it found substantial material against him. However, events took a bizarre turn. The local police not only surrounded the CBI officers, who went to Kumar’s residence, but they also laid siege to the CBI office in the city and the official residence of the Joint Director of the central agency. The officials, who went to the Police Commissioner’s residence, were held captive and their mobile phones were taken away. 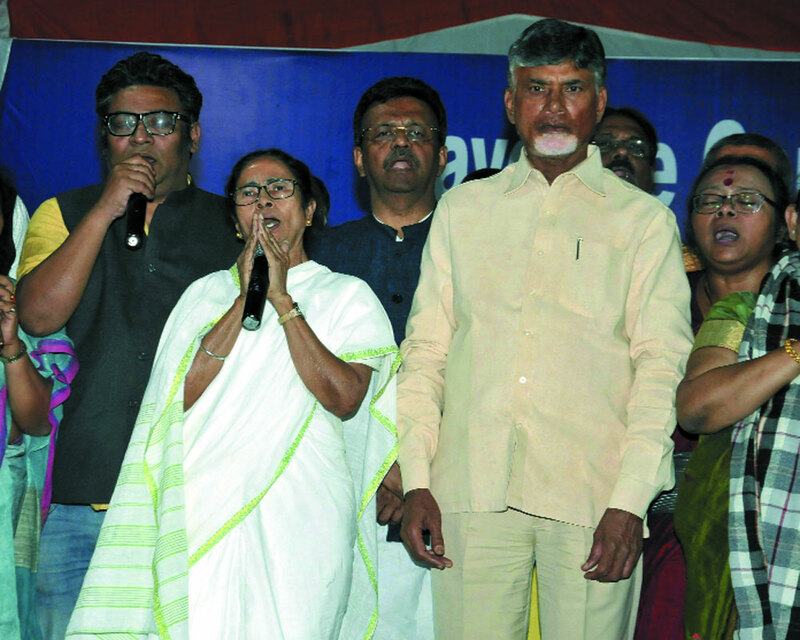 As if all this was not enough, Rajeev Kumar and other senior police officers of the State joined Chief Minister Mamata Banerjee when she began a dharna, which the CBI said was indicative of absolute anarchy. There is no parallel to this kind of lawlessness. But what is even more unconstitutional is that the State police behaved in this manner despite the fact that the CBI was investigating these cases on the explicit orders of the Supreme Court. The CBI came into the picture only because the court directed it in May, 2014, to investigate the Saradha and other chit fund scams in West Bengal and other States. The court had also directed the West Bengal Government to hand over all the chit fund scam cases to the CBI. In that judgement, the court noted that more than 25 lakh claims had been received by various commissions of inquiry set up in Odisha and West Bengal and this was indicative of the magnitude of the scam in terms of the number of citizens who had been defrauded by ponzi companies. The court observed that the investigation conducted until then revealed involvement of several political and other influential personalities, who wielded considerable clout and influence. It said that it wanted the State Government to hand over the cases to the CBI because of the sensitivity of the issues involved, the inter-state ramifications of the scam and because of the need to ensure credibility of the investigation. “Investigation by the State police in a scam that involves thousands of crores collected from the public allegedly because of the patronage of people occupying high positions in the system will hardly carry conviction especially when even the regulators who were expected to prevent or check such a scam appear to have turned a blind eye to what was going on”. Since Banerjee and several other leaders, who are part of the coalition against the Bharatiya Janata Party (BJP) claim that the actions of the CBI indicate that the federal structure is under assault, it is best to look at the foundations on which the Indian Constitution rests. Further, responding to criticism that the Centre has been given the power to override the States, Ambedkar said, in a moment of crisis, a conflict of claims may arise and it is then apparent that ultimate allegiance cannot be divided…..(and) the bare question is, what authority commands the residual loyalty of the citizen? Is it the Centre or the Constituent State? Answering this question, he said, “There can be no doubt that in the opinion of the vast majority of the people, the residual loyalty of the citizen in an emergency must be to the Centre and not to the constituent States. For, it is only the Centre which can work for a common end and for the general interests of the country as a whole. Herein lies the justification for giving to the Centre overriding powers to be used in an emergency. And after all what is the obligation imposed upon the constituent States…No more than this — that in an emergency, they should take into consideration alongside their own local interests, the opinions and interests of the nation as a whole”. Those objecting to the arrival of CBI officials at the doorstep of the Kolkata Police Commissioner’s residence need to be reminded of the investigative body’s actions in Gujarat, when the Congress-led United Progressive Alliance ran the country between 2004 and 2014. The CBI arrested three senior police officials before arresting BJP chief Amit Shah in the Sohrabuddin case. Later, the special CBI court discharged Shah from the case. Narendra Modi, then the Chief Minister of Gujarat, was interrogated for nine hours in the Gujarat riots related cases. Throughout this period, the CBI functioned from Ahmedabad without any hindrance from the State Government. Also, there was no street theatre to mock at the Union Government and the CBI. Even after the higher judiciary passed orders in his favour, vendetta politics of the Sonia Gandhi-Manmohan Singh combine continued against Modi. Chief Ministers like Banerjee and Arvind Kejriwal, who indulge in dharna politics, need to be reminded of Ambedkar’s advice when he summed up the debate on the Constitution in the Constituent Assembly. He said: “If we wish to maintain democracy not merely in form, but also in fact, what must we do? The first thing in my judgement we must do is to hold fast to Constitutional methods of achieving our social and economic objectives. It means we must abandon the bloody methods of revolution. It means we must abandon the method of civil disobedience, non-cooperation and satyagraha. When there was no way left for Constitutional methods for achieving economic and social objectives, there was a great deal of justification for unconstitutional methods. These methods are nothing but the grammar of anarchy and the sooner they are abandoned, the better for us”. All political leaders, who were supporting Banerjee’s dharna the other day need to ponder over this.